Touraine Solante Gole syndrome [TSG] or Primary hypertrophic osteoarthropathy [PHO] or Pachydermoperiostosis [PDP] characterized by three major criteria such as pachydermia (skin thickening), digital clubbing [grade IV Hypertrophic Osteoarthropathy (HOA)] and periostosis. It is a hereditary disease inherited as an autosomal dominant trait. A diagnosis of TSG syndrome can be entertained only after various causes of secondary HOA are carefully excluded since it accounts for only 3-5% of all HOA. A 35-year-old male presented to the medicine outpatient department with chief complaints of fatigue, dysphagia, and joint pain for the last 2 years. General examination revealed coarse facial features with furrowing of forehead skin into multiple transverse folds, thickened and folded skin of the face, and eyelids with mechanical ptosis [Figure 1]a. The patient also had broadening of fingers and toes with Grade IV digital clubbing (hypertrophic osteoarthropathy [HOA]) [Figure 1]b and broadening of both lower limbs including the ankle and feet [Figure 1]c. Scalp examination showed furrows oriented parallel to the sagittal plane (typical gyrate appearance). There were no significant complaints pertaining to cardiac and respiratory systems. No other members of his family exhibited similar complaints. X-ray skull (lateral view) revealed calvarial bone thickening [Figure 1]d both radius and ulna showed symmetric, exuberant, and irregular subperiosteal bone formation (hyperostosis) with cortical thickening and X-ray of both the hands and wrists showed increase in soft-tissue around terminal phalanges with hypertrophy of distal tufts, periostitis, and hyperostosis of all metacarpals including proximal as well as middle phalanges [Figure 1]e and both tibia and fibula showed gross irregularities and intense periosteal proliferation throughout the shaft including epiphysis with resultant broadening of the epiphysis [Figure 1]f.
When we investigated for dysphagia, upper gastrointestinal (GI) endoscopy showed hypertrophic gastropathy [Figure 2]a. On laboratory investigation, complete hemogram revealed severe anemia (Hb: 4.2 gm/dl) and thrombocytopenia (platelet count: 86000/μL). Peripheral smear examination showed many teardrop erythrocytes and occasional nucleated red cells (4/100 white blood cells [WBCs]) along with immature granulocytes suggestive of leukoerythroblastic blood picture (total WBC count – 12,700 cells/μL, DC – myelocytes [2%], metamyelocytes [6%], band forms [8%], neutrophils [51%], eosinophils [2%], lymphocytes [28%], monocytes [2%], and basophil [1%]). Occasional giant platelets were seen [Figure 2]b. Bone marrow aspiration and biopsy were performed. Aspirate done thrice revealed only dry tap. Subsequently, the patient underwent bone marrow biopsy which showed hypocellularity with hematopoietic cells surrounded by diffuse fibroblastic proliferation with abundant fibrosis, collagenization [Figure 2]c, and clustering of numerous atypical megakaryocytes [Figure 2]d. No atypical cells or granulomas were seen. 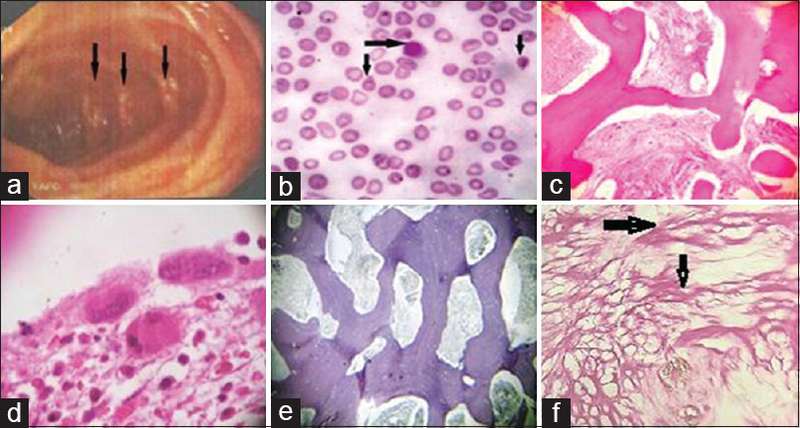 Special stains, such as reticulin and van Gieson stains [Figure 2]e and [Figure 2]f, done on bone marrow biopsy confirmed fibrosis and collagenization. The peripheral smear and bone marrow picture was suggestive of myelofibrosis. Other routine tests such as erythrocyte sedimentation rate, serum electrolytes, blood sugar, renal, thyroid and liver function test, lipid profile, rheumatoid factor, urine analysis, and cardiac evaluation revealed no abnormalities. Chest radiograph taken to rule out pulmonary causes of HOA was found to be normal. Based on all the above features, diagnosis of primary idiopathic type of Touraine–Solente–Gole (TSG) syndrome/HOA with unusual serious complications of myelofibrosis and hypertrophic gastropathy was made after exclusion of secondary causes of HOA. TSG syndrome coexists with a variety of clinical manifestations including palmoplantar hyperhidrosis, joint pain, arthritis, cutis verticis gyrate, and ptosis., Males are more commonly affected compared to females with a male-to-female ratio of 9:1. The disease typically appears in infancy and adolescence, progresses for a number of years, and then stabilizes. This syndrome was first described by Nikoleus Fredreich in 1868 as “hyperostosis of the entire skeleton.” It was only 45 years ago that the People's Democratic Party was first recognized as a distinct entity by TSG in 1935. First reported cases were the Hagner brothers, who had typical features of this syndrome. The study of this syndrome is still controversial because of its complexity and broad clinical aspects. According to Santos-Durán et al., the disease is classified either as primary (hereditary or idiopathic) or as secondary form. Diagnostic criteria for TSG are as follows: major criteria – pachydermia, periostosis, and finger clubbing and minor criteria – hyperhidrosis, arthralgia, hypertrophic gastritis, ptosis, joint effusion, seborrhea, acne, and flushing. The involvement of epiphysis of bone distinguishes primary form from the secondary form that typically spares the epiphysis. Irwin suggests that bone lesions in this secondary form are more painful and progress more rapidly, whereas skin changes range from slight to moderate. The prognosis ultimately depends on the underlying disease. The pathogenesis of this syndrome is still poorly understood. Many researches all over the globe have reported that high levels of vascular endothelial growth factor (VEGF) in these patients induces vascular hyperplasia, new bone formation, edema, and therefore, VEGF is postulated as the prototypical osteogenic–angiogenic coupling factor in the pathogenesis of TSG and myelofibrosis. Sohn et al. proposed that a neurological basis is posited and stimulation of the vagal neural crest has been suggested as an etiological factor, given that the syndrome in some patients reverses after a vagotomy. More recently, abnormalities in fibroblast functionality have been implicated, along with an increase in the synthesis of collagen fibers. A degree of chromosomal instability and a greater incidence of human leukocyte antigen-B12 antigen are considered possible, as genetic disorders such as xeroderma pigmentosum, ataxia-telangiectasia, and Fanconi anemia have been described in association with TSG. A recent analysis by Diggle et al. suggested that these patients with prostaglandin transporter SLCO2A1 mutations were more likely to develop myelofibrosis. Major complications of TSG include facial epidermoid carcinoma, hypertrophic gastritis, peptic ulcer, gastric adenocarcinoma, Crohn's disease, and myelofibrosis. The mechanism of anemia has been proposed to be multifactorial and includes blood loss from the GI tract, bone marrow failure by myelofibrosis or narrowing of the medullary spaces, and the presence of an inhibitor of erythropoiesis. Our patient had all the dermatoradiological manifestations of TSG syndrome. Of note, our patient developed a very rare serious complication “myelofibrosis.” Till 2015, only 22 cases of TSG with myelofibrosis have been reported worldwide. He also had hypertrophic gastropathy which is an infrequent association mentioned in the literature since it occurs only in 27% of patients with TSG. The importance of ruling out the secondary forms of HOA for definitive diagnosis of TSG syndrome needs to be underlined since it accounts for only 3%–5% of all HOA. No standard treatment for myelofibrosis in TSG patients has been established so far. Blood transfusion may sometimes be the only way to improve severe anemia but not to cure the disease. Our patient was treated with blood transfusion for anemia, nonsteroidal anti-inflammatory drugs, and bisphosphonates for treating joint pain and advised follow-up. This case of TSG syndrome is presented for its extreme rarity, unusual initial presentation with anemia, and dysphagia which on evaluation revealed myelofibrosis and hypertrophic gastropathy. Myelofibrosis is a rare, unusual complication of TSG which can easily lead to delayed diagnosis having a negative impact on the prognosis if the interpreting expert is not aware or suspicious of it in these patients. This case is also presented to emphasize the importance of close follow up of these patients to avoid as well as treat rare complications like myelofibrosis earlier. Santos-Durán JC, Yuste-Chaves M, Martínez-González O, Alonso-San Pablo MT, Sánchez-Estella J. Pachydermoperiostosis (Touraine-Solente-Golé syndrome). Case report. Actas Dermosifiliogr 2007;98:116-20. Karnan S, Krishnamoorthy V, Ethiraj P, Sathyanathan BP. Touraine-Solente-Gole syndrome: The complete form needs to be recognized. Indian J Nucl Med 2012;27:201-4. Rajan TS, Sreekumar NC, Sarita S, Thushara KR. Touraine Solente Gole syndrome: The elephant skin disease. Indian J of plast surg 2013;46:577. Castori M, Sinibaldi L, Mingarelli R, Lachman RS, Rimoin DL, Dallapiccola B. Pachydermoperiostosis: An update. Clin genet 2005;68:477-86. Sandoval AR, Flores-Robles BJ, Llanos JC, Porres S, Dardón JD, Harrison RM, et al. Cutis verticis gyrata as a clinical manifestation of Touraine-Solente-Gole' syndrome (pachydermoperiostosis). BMJ Case Rep 2013;2013. pii: bcr2013010047. Shin KC, Chung WJ, Lee KY, Shin MS, Kim SH, Jo YJ, et al. Pachydermoperiostosis accompanied by heart failure. Journal of cardiovascular ultrasound 2009;17:135-7. Ginsburg J. Hypertrophic pulmonary osteoarthropathy. Postgrad Med J 1963;39:639-45. Hammarsten JF O'leary J. Hypertrophic pulmonary osteoarthropathy. Arch Intern Med 1957;99:431. Wierman WH, Clagett OT, Mcdonald JR. Articular manifestations in pulmonary diseases: An analysis of their occurrence in 1,024 cases in which pulmonary resection was performed. J Am Med Assoc 1954;155:1459-63. Buchan DJ, Mitchell DM. 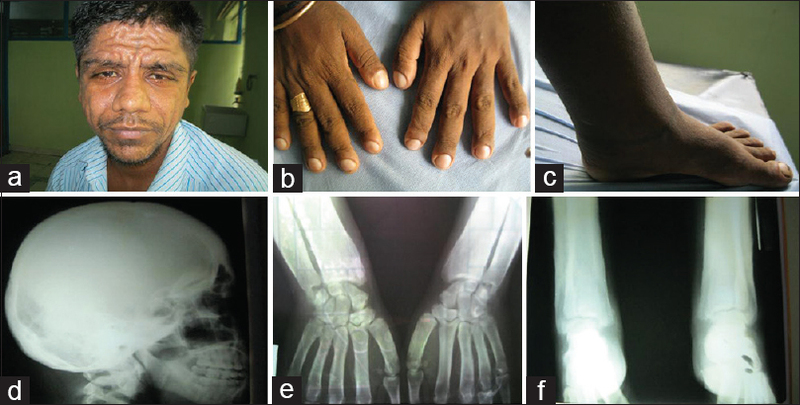 Hypertrophic osteoarthropathy in portal cirrhosis. Ann Intern Med 1967;66:130-5. Miller ER. Carcinoma of the thymus, with marked pulmonary Osteo-arthropathy. Radiology 1939;32:651-60. Ive FA. Metastatic carcinoma of cervix with acanthosis nigricans, bullous pemphigoid and hypertrophic pulmonary osteoarthropathy. Proc R Soc Med 1963;56:910. Irwin RS. Knee discomfort in a 38-year-old man. Chest 2002;122:2242-5. Silveira LH, Martínez-Lavín M, Pineda C, Fonseca MC, Navarro C, Nava A, et al. Vascular endothelial growth factor and hypertrophic osteoarthropathy. Clin Exp Rheumatol 2000;18:57-62. Sohn SH, Ryu SH, Kwon HC, Park MK, Lee SW, Chung WT, et al. Acase of hypertrophic osteoarthropathy associated with nasopharyngeal carcinoma in a child. J Korean Med Sci 2003;18:761-3. Fietta P, Manganelli P. Pachydermoperiostosis and psoriatic onychopathy: An unusual association. J Eur Acad Dermatol Venereol 2003;17:73-6. Lee SC, Moon HJ, Cho D, Ryang DW, Kim SJ, Chun IK, et al. Pachydermoperiostosis with cutaneous squamous cell carcinomas. Int J Dermatol 1998;37:693-6. Diggle CP, Parry DA, Logan CV, Laissue P, Rivera C, Restrepo CM, et al. Prostaglandin transporter mutations cause pachydermoperiostosis with myelofibrosis. Hum Mutat 2012;33:1175-81. Ikeda F, Okada H, Mizuno M, Kawamoto H, Okano N, Okazaki H, et al. Pachydermoperiostosis associated with juvenile polyps of the stomach and gastric adenocarcinoma. J Gastroenterol 2004;39:370-4. Bachmeyer C, Blum L, Cadranel JF, Delfraissy JF. Myelofibrosis in a patient with pachydermoperiostosis. Clin Exp Dermatol 2005;30:646-8. Tanaka H, Maehama S, Imanaka F, Sakai A, Abe K, Hamada M, et al. Pachydermoperiostosis with myelofibrosis and anemia: Report of a case of anemia of multifactorial causes and its improvement with steroid pulse and iron therapy. Jpn J Med 1991;30:73-80. Li S, Li Q, Wang Q, Chen D, Li J. Primary hypertrophic osteoarthropathy with myelofibrosis and anemia: A case report and review of literature. Int J Clin Exp Med 2015;8:1467-71. Jajic I, Jajic Z. The spectrum of skeletal and visceral abnormalities in 52 patients with primary hypertrophic osteoarthropathy. Clin Exp Rheum 1992;10:73. Rajan TM, Sreekumar NC, Sarita S, Thushara KR. Touraine Solente Gole syndrome: The elephant skin disease. Indian J Plast Surg 2013;46:577-80.